Marketers, be forewarned: Lock up those popular spokescharacters to long-term, no-compete deals or risk having them turn against you. 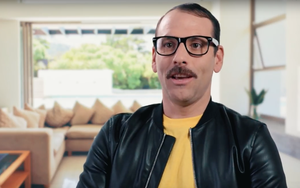 Nearly a year into a campaign that featured Verizon’s famous “Can you hear me now?” character (played by actor Paul Marcarelli) switching to Sprint and declaring there is little difference between their networks, the latter is releasing a series of videos humorously highlighting those who have (fictionally) taken inspiration from him. The vignettes take the form of a television news magazine called “Your World with Luther North.” Each short segment explores a different element of the “craze,” from people dressing like Marcarelli to naming their babies after him (and getting tiny black-framed glasses and onesies in take-home packages) to erecting 30-foot statues in his honor. At the end of each segment, the newsmagazine catches up with Marcarelli to get his take on the phenomenon (often a mix of flattery and incredulity). The videos were created in partnership with Onion Labs, the content studio of the satirical magazine. The Onion is well known for its satirical takes on the news and popular culture and has strong connections with famously hard-to-reach Millennials, Palmer says. Sprint debuted its campaign featuring Marcarelli in June 2016, and the company has declared it is its most popular advertising campaign ever. The original ad has garnered more than 14 million views on YouTube since its debut according to the company.